Ubuntu 11.04 Natty Narwhal Reviewed: This is My Favorite Ubuntu EVER! It has been almost a week since the final release of new Ubuntu 11.04 Natty Narwhal happened. I have been using Ubuntu 11.04 Natty Narwhal ever since it's first alpha release came out and I am really impressed with the end product. 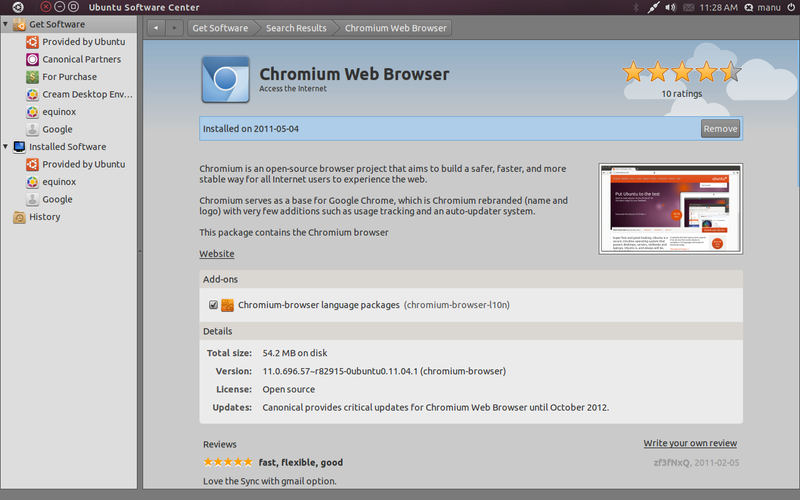 So, is it a bit of overstretch to give Ubuntu 11.04 the "favorite Ubuntu ever" title already? Let's explore. What's so new about it? EVERYTHING! Gone are the days of incremental improvements as far as Canonical and Ubuntu are concerned. 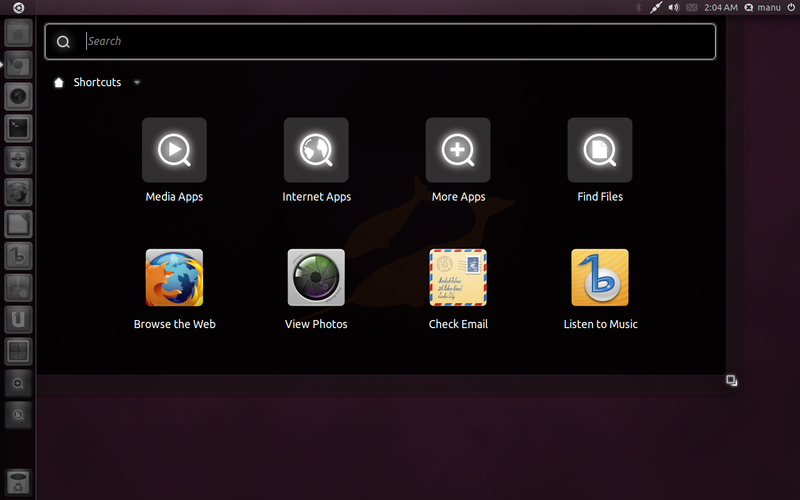 Ubuntu 11.04 is a giant leap forward. But not all of the changes have been received well amongst it's huge loyal user base. I have been receiving regular mails from people complaining about anything and everything about new Ubuntu 11.04 and it's Unity interface. So I have finally decided to get my point across. Ubuntu 11.04 Natty Narwhal, without any sort of hesitation, is my favorite Ubuntu ever, period. Having said that, I never really had any sort of major technical issues with any Ubuntu releases so far. All my hardware drivers including that of wifi and graphics ones are enabled automatically and Compiz has always worked like a charm. From the mails I have been receiving, one common factor I noticed above all, are issues somehow related to Compiz. Maybe the smooth Compiz rendering itself is the primary reason why I like Ubuntu 11.04 so much. But the Unity factor cannot be ignored. Take the new Unity launcher for example. Unity launcher coupled with its useful array of Unity keyboard shortcuts are proving to be the real difference as far I am concerned. In my case, there are around 5-6 most commonly used applications in Ubuntu and all I need is to include them in the Unity launcher. That's it. I can easily access my favorite apps in no time. Now, let's take it step by step. What are the new stuff that makes Ubuntu 11.04 really special. Let's start with the installation part. 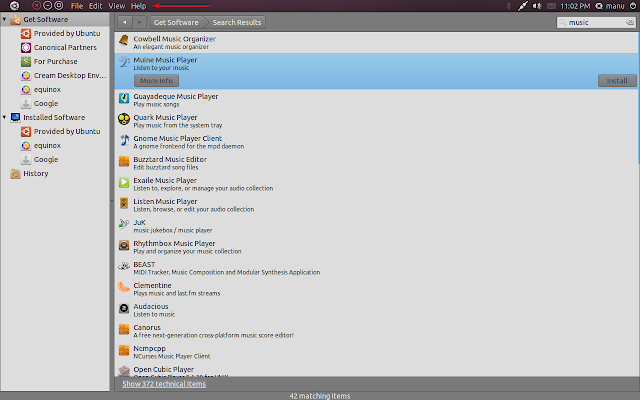 Many things are new in the Ubuntu 11.04 Natty Narwhal installer. Crucially, there is now an option to upgrade directly from Ubuntu 10.10 to latest Ubuntu 11.04 and yes, the installer will automatically detect whether you have Ubuntu 10.10 already installed in you PC or not. 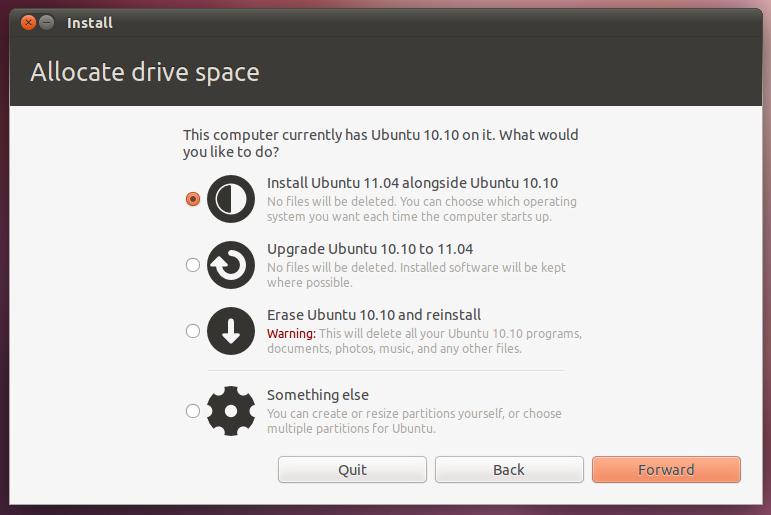 See the second option in the screenshot - "Upgrade Ubuntu 10.10 to 11.04". I chose to reinstall it though. Other improvements with installer menu include options to download and install restricted extras via internet during the installation phase itself and a new good looking slide show of different features offered in the new Ubuntu. Creative New Sliders, Global Menu etc. With people going for hardware with lesser and lesser screen size, optimal utilization of space becomes paramount. 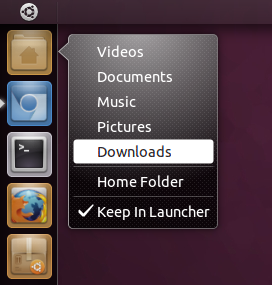 With that in mind, Ubuntu 11.04 Natty Narwhal has removed the below panel and introduced the new launcher with intellihide enabled. Apart from that, two other improvements have also been made. One is the improved slider as shown in the screenshot. The space for slider is not enabled by default and instead a nifty new widget sits there which is enabled only when you move the cursor near to it. It looks pretty cool too. Ubuntu Software Center in full screen mode. Notice the position of menu items and close, minimize, maximize buttons respectively(see the arrow on top). It saves a lot of space and there are these super cool keyboard and mouse shortcuts to put windows in global menu(maximize) and also to detach windows from it. More on it later. 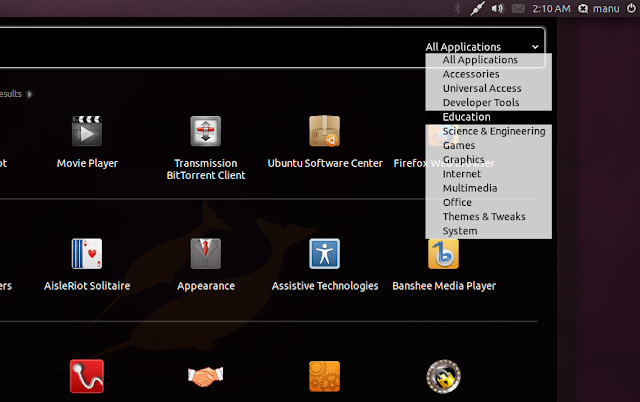 Finding and launching applications have never been easier, thanks to the new 'Dash' introduced in Ubuntu 11.04 Natty Narwhal. Hit Super key, simply type the first few letters of the application you are looking for and Dash/Lenses will do the rest(while Super + a activates Application Lense, Super + f activates Files and Folder Lense). To make things even easier, you can now drag and drop applications into the Unity Launcher directly from Dash. So if you are wondering how to find an application from 'application lense' if you don't know/remember its name, well, the screenshot above gives you the answer. Of course you can choose applications from different categories which not only shows the installed applications, but two other categories along with it. Most frequently used apps and the ones you can install. Choosing the latter will take you to the Ubuntu Software Center. Tiling - Dragging a Window to the left/right border will auto tile it to that side of the screen(see screenshot above). One of the highlights of new Unity experience. Clicking and holding an icon and then dragging it around will allow you to reorder it on the launcher. You can also drag it off to the right of the launcher to move it around. Note that you need to make an explicit movement to the right to move the icon off the launcher before you can move it around. Dragging and Dropping an icon into the trash can will remove it from the Launcher. Moving and holding the cursor on the left side for a few seconds will launch Unity dock. Scrolling the mouse wheel while over the Launcher scrolls the icons if you have too many and need to move around quickly. A more elaborate lis here: Essential Ubuntu 11.04 keyboard and mouse shortcuts. Ubuntu Software Center adds the much needed ratings and reviews support which will hopefully make the process of finding good applications a little more easier. There are other subtle improvements as well. Like, after you install an application, Software Center will ask whether you want to add that application into the Unity Launcher or not. LibreOffice becomes the new default Office suite. Shotwell photo manager and editor is another useful addition. 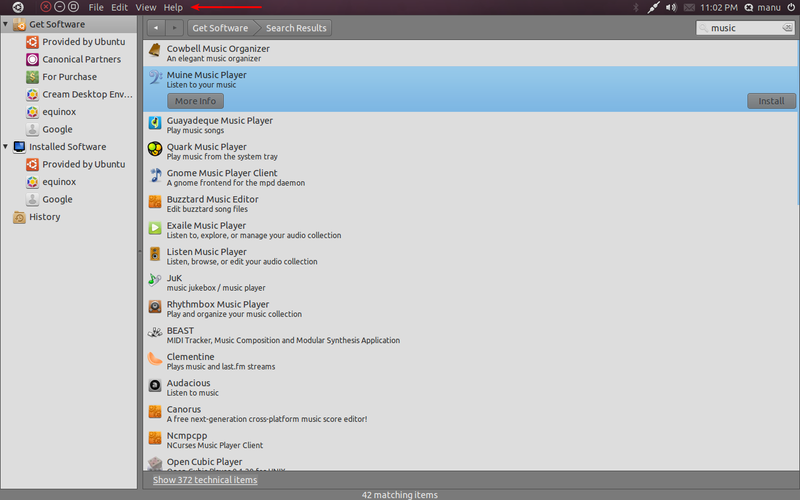 Banshee is the new default music player replacing Rhythmbox. Ubuntu classic: Fallback mode for computers not able to run Unity(it needs Compiz ie) and for those who don't want to use Unity. Ubuntu Classic is available as a different session at GDM login. Go grab your copy from www.ubuntu.com right now! I was NOT using the default Ubuntu theme for any of the screenshots above. 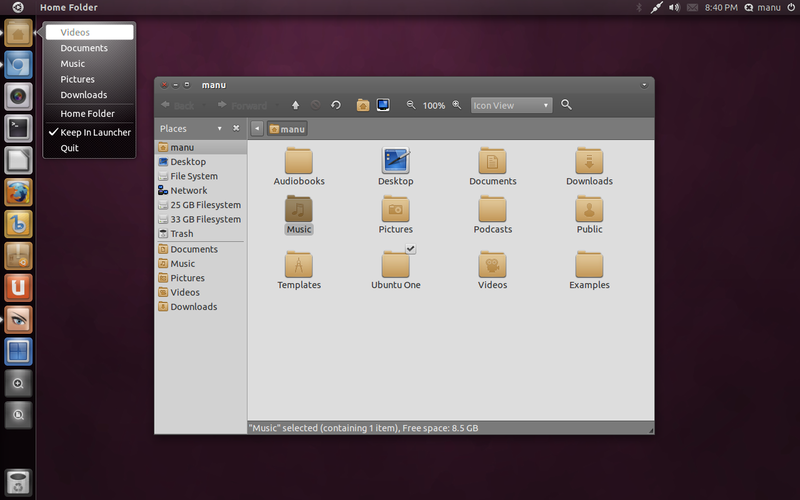 Here is the one I was using: Equinox Evolution Themes for Ubuntu 11.04. I am aware that a lot among you are finding it really hard to cope with the latest Ubuntu 11.04 Natty Narwhal. I am also aware that the Unity interface has its share of bugs and can become quite unstable at times. But even with all those drawbacks, to pull of such an enormous feat in less than 6 months or so, is commendable. I for one is deeply impressed with the new Ubuntu release and I hope that the desktop team will be able to remedy the minor niggles soon enough. Give it some more time folks. Unity will grow on you.